The Stomper name came to the public in 1980. The original stompers had two settings: off and on. The collection consisted of 13 vehicles, each with two color combinations. The original ones had 1/4" wide tires, which were made out of foam or rubber. 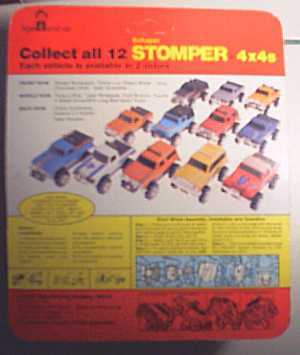 Many of the Gen I Stompers had a front bumper that was on the base of the stomper. The very first ones clipped the top to the bottom with two side clips, while the next version had the now typical clips in the front and the back. There are two main styles of package, but there are five variants total. 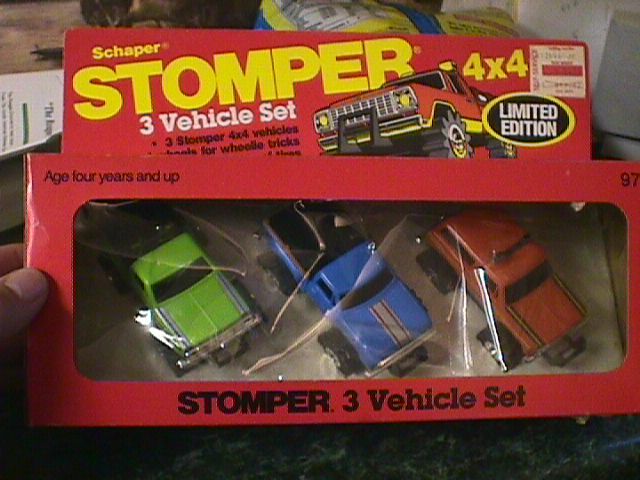 Sometimes the stompers came out in sets of three. This is what one backside of a package looked like, and here is another backside of a package. 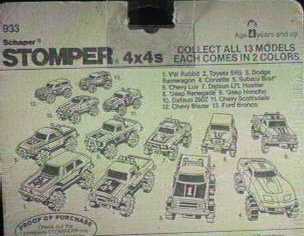 Sometimes the stompers came with this advertisement. Gen 1 Innards (37k) can be seen here. 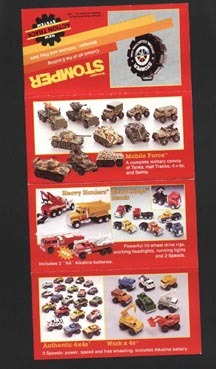 1981 was not a huge catalog increasing year for stomper. The only truly new item was the introduction of the SSC Super Cycles. They were rip cord powered (rather than AA) and never really fit in with the rest of the lineup. Stompers really started to take off in 1982. We saw the introduction of the set of 6 Fun x 4's, which were fairly standard vehicles. We also saw the set of 4 Work x 4's, which included a dump truck, cherry picker, tow truck, and a cement truck, each in two different color schemes. Stomper also took the stakes up from 4x4 to 10x10 in 1982 by venturing into tractor trailer trucks with the Semis. Last, and certainly not least, 1982 saw the introduction of the Official Competition Pull Set! This great addition came with 1 vehicle, a pulling rig, the hitch mechanism, a weight box, and two pylons. Let the pulling begin! How about a brief look at the Catalogs?